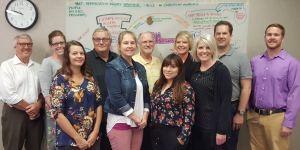 Thrive Action Teams are key to the advancement of its mission – to ensure that all children in the Sioux Falls area have the resources they need to achieve their highest academic and career potential. A-Teams use a collective impact approach to address complex obstacles to student success, focusing on creating systemic change in the conditions surrounding the educational system. Success is achieved when an outcome or goal has been attained, with the result that either the cause of the obstacle is eliminated or that programs, policies, funding streams, and/or services are permanently altered, reducing the impact of the problem on a continuing basis. represent a cross-sector of the business, government, nonprofit and faith-based communities. have knowledge and experience to contribute to the ecosystem issue being addressed. are willing to make a commitment to participate regularly in A-Team activities.